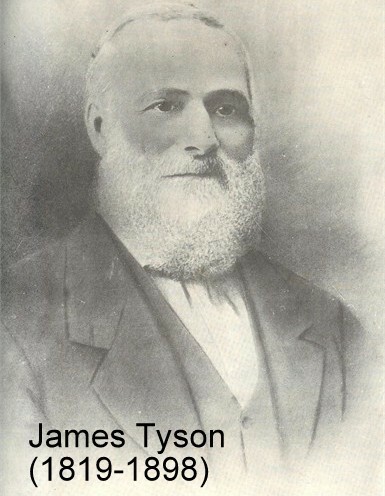 This is the story of James Tyson, an Australian pioneer born of a convict mother in 1819. He was to become the wealthiest man in Australia by the time of his death in 1898. He was very well known during his life, not only for his wealth but for his idiosyncratic nature. He lived a frugal life, never smoked, drank liquor, swore or married. He died without leaving a will and as a result his estate was the subject of long-running litigation. My great grandmother was one of the legatees. This web site tells the story of James Tyson through the eyes of a Sydney newspaper called The Sydney Morning Herald. I’ve begun trawling the pages of the newspaper starting with the first mention of Tyson in 1848. As I find interesting news items I’ll add posts with extracts and comments. To see all the posts click here. This tree is primarily a transcription of the original family tree of the descendants of James Doneley, William Tyson and Dennis Sheil published by the D., T. & S. Committee to commemorate the family gathering at Campbelltown, NSW, on Australia Day, 1980.